This topic contains screenshots made by me or other users. I am working on making the cards look less similar in 0.4. Having plenty of different quality artwork is not feasible for a hobby game, so I need to be a bit creative. I created a number of foil layers, each with many variations and apply these now to each card by default. Also the card rendering improved, with the card name looking fancier and in color of the rarity. The artwork can also be flipped. 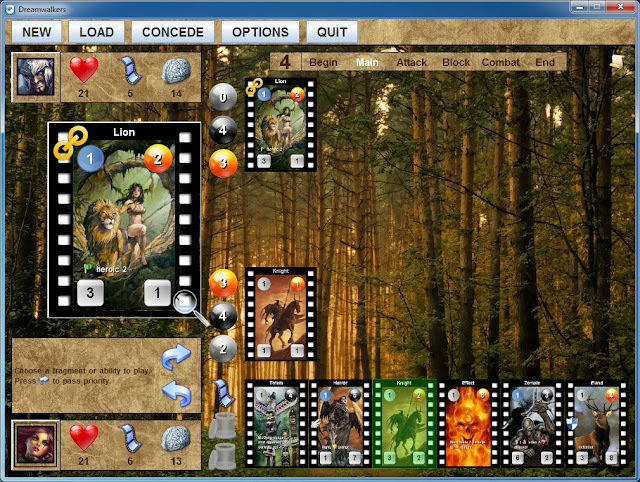 Release 0.5 will support downloadable alternate card art, fully modable by users. Searching art on the web can be quite time consuming, but I will try to provide a file as starting point. This is certainly a feature allowing users to contribute to this game in a major way. Right now I have already 10 alternate arts for Angel next to the default one. I am working on a sample alternate artwork download file. I will provide that file on the forum as download. Users will be free to extend it and share it. The alternate art makes the cards look much more varied as expected. Release 0.5 supporting this feature is scheduled for tomorrow. Release 0.5 is postponed for a day. It will also have other improvements. I am still working on the sample art download file. While it is a lot of fun to find nice art on the web, it is also very time consuming. Game will have 300 card arts with this file, but there is not really a hard limit. 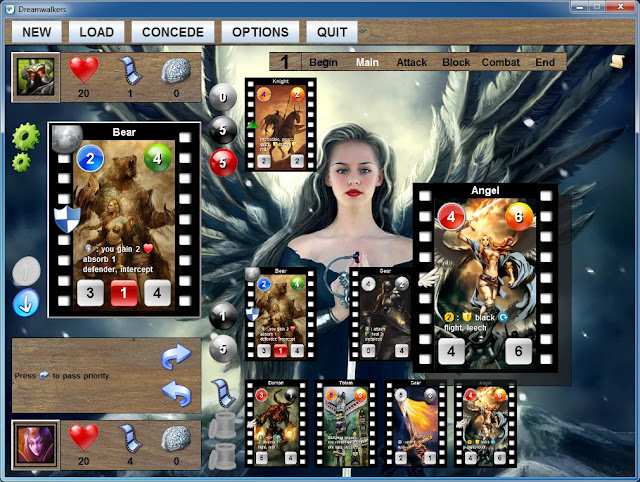 Release 0.5 contains several improvements, like the custom card art support and maximized deck editor mode. I improved the wood theme for release 0.7 (at least I hope it is). I also added the nature theme, which is one of the ten additional themes available by donating. The Wiki page contains some brand new screenshots for release 0.8. Release 0.9 has a neat new feature. The targeted permanent of the selected item on the stack is now shown with a curved connector line. This is very helpful to see what is happening. I finished my very first game with black and red scoring 1049 points. Game is fast paced, partly thanks to UI, and is basically an arcade Magic flavored card game, the way I like it. A fix is however needed to end the game properly which will be available in 0.10. I finished the second game playing green and orange scoring 1118 points. The AI plays quite well, certainly if you consider I did not really tweak it yet, like the scoring. Shows how flexible the Magarena AI engine can be, because it supports thousands of cards in this game. But it does do some strange things occasionally, like playing a card without any effect. The game runs stable and does not have any show stopping bugs that I noticed. The mana system works like a charm. No need for those pesky lands. Some screenies, the first one shows how big creatures can become in this game thanks to gear and other effects. The second shows how close the game can be. I lost the last duel two times with the computer having only a single life left and won it with having only one life left myself. Third shows the final deck and score. Finished a dream with blue and red scoring 859 points. Game is very suitable to play like 15 or 30 minutes a day, which is what I usually do. A lot of the wins are narrow, with not much player life left, which is good I think. Another example of how powerful your minions can be. This minion really flipped the game, but it took time. The replacement of totems by muse minions works well for me. I finished another dream with black and red scoring 1575 points. The collected deck contains several powerful cards. Minions with flying are usually very good, especially with some gear attached. Nice screenshots! I don't have time to play these days. Thanks! Well I did not have any time to develop.